Kowloon and the New Territories holds a wealth of fascination to the transport enthusiast. independent transport videos took their cameras back here in late 2007 to capture the transport scene. The main bus company that features here is KMB, Kowloon Motor Bus, a vast company operating the latest in modern double decker technology in the shape of Wrights bodied Volvos and the newest Enviro 500s. Alongside these are Dennis Tridents with Alexander and Duple Metsec bodies in the now familiar champagne gold air-con livery, together with Volgran bodied Volvos and Tridents, not to mention Neoplan Centroliners. Mid life air-con buses are Alexander Leyland and Volvo Olympians with Duple Metsec Dennis Dragons in the white air-con livery. KMB also operate a now diminishing non-air con fleet of Olympians and Dragons in the original red and cream livery. These vehicles can be seen on a special ‘Riding Non-air con’ programme that is now available. Other companies operating in this part of Hong Kong and on this video are New World First Bus and Citybus. 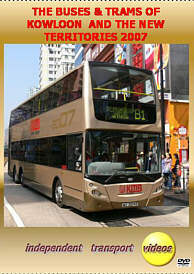 Further action featuring these companies can be seen in more detail on ‘The Buses & Trams of Hong Kong Island 2007’. Our journey starts at Mong Kok where we are greeted with the ‘Year of the Pig 2007’ Olympian in the bus station. We move down Nathan Road to Jordan Road to Jordan Bus Station where most types can be seen going about their daily business. From our filming location on Salisbury Road we arrive at Tsim Sha Tsui, one of the terminals for the Star Ferry. Moving into the New Territories we visit the busy towns of Kwun Tong, Tsz Wan Shan, Mei Foo and Tsuen Wan. The Light Rail system is filmed in brief in Tuen Mun and Yuen Long, we also see buses from the KCRC fleet with their fleet names removed as the merger of the KCRC company and the MTR company was about to take place. Sha Tin and Sheung Shui are also locations for filming, the latter is where there is a concentration of single deckers from the KMB fleet. This video programme will be an excellent addition to your collection of Hong Kong transport.